In this lesson, we will learn how to identify whether a number up to 20 is even or odd by grouping objects in pairs and skip counting by 2s. Here is a group of 9 people. 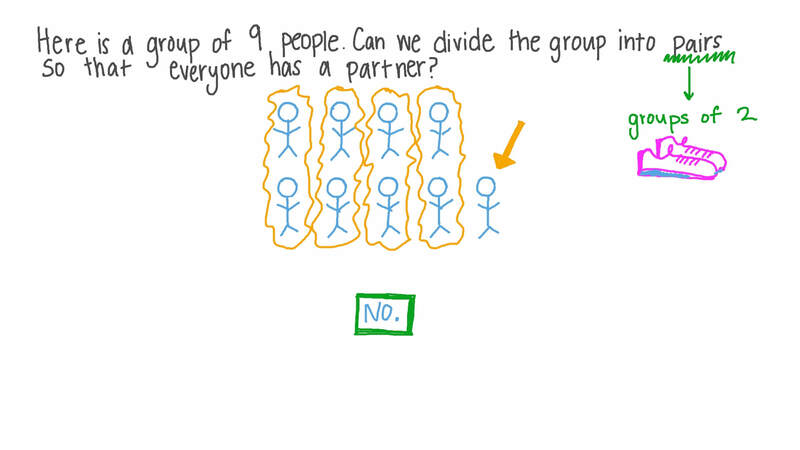 Can we divide the group into pairs so that everyone has a partner? 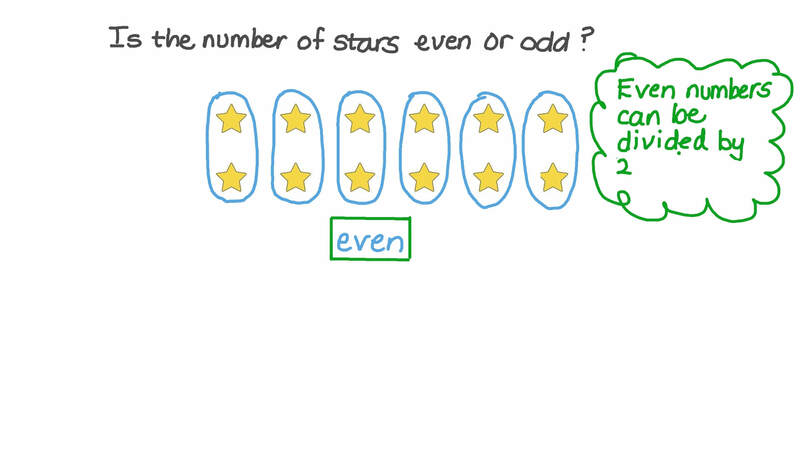 Is the number of stars even or odd? Salma counted 19 plants in her garden, but 4 of them were weeds. Will she have an even or odd number of plants after she removes the weeds? Why? A An odd number, because 15 things have one left over when you put them in pairs. B An even number, because 4 is even. C An even number, because there will not be one left over. D An odd number, because the digit 1 in 15 is odd. Here is a group of 8 people. A number is odd if we cannot split it into groups of two with nothing left over. If we try to split these 9 squares into groups of 2, there is always one left over. So, 9 is odd. Which of the following numbers is odd? Here are 57 dots. Is 57 even or odd? Nada is using ten frames to see if 14 is even or odd. She knows that even numbers can be grouped into pairs, so she colours 14 squares in two ten frames and tries to see if every square has a partner. She notices that the first ten frame is full and can always be grouped into pairs. So, to decide if the number is odd or even, she needs to look at the second ten frame, which is the ten frame for the unit digit. Now it is your turn. Is 17 even or odd? Why? Here are 46 dots. Is 46 even or odd? Every child has a partner to work with.